The 190MW KIEL coastal power plant is being developed on the eastern shore of the Kieler Förde inlet in northern Germany. Image: courtesy of Stadtwerke Kiel. Construction on the second phase of the Kiel plant began in November 2016. Image: courtesy of Stadtwerke Kiel. Excess district heating generated by the plant will be stored in a 60m-tall heat storage unit and will be used when needed. Image: courtesy of Stadtwerke Kiel. German municipal utility, Stadtwerke Kiel, is developing Europe’s most modern gas engine heating power plant on the eastern shore of the Kieler Förde inlet in northern Germany. Named KIEL (Kiel’s intelligent energy solution), the 190MW gas-fired power plant will use 20 highly efficient gas engines for power generation. With a thermal output of 192MW, the power plant will supply district heating for the city of Kiel. A feasibility study for the plant was completed in 2012 and the construction license was granted on 19 September 2016. Estimated to cost €290m ($331.8m), the power plant was approved by the board of Stadtwerke Kiel in November 2016 and is expected to be commissioned in 2018. The KIEL power plant will replace the existing coal-fired power plant, operating since 1970, and will reduce carbon dioxide emissions by 70%. It will comprise a gas-fired power plant, electrode boiler, and a heat storage unit. Energised with powerful Jenbacher J920 FleXtra gas engines, the plant is capable of reaching a nominal output of 190MW from a complete standstill in less than five minutes. Hot water generated in the electrode boiler can be stored in the heat storage unit, which holds up to 42,000m³ of water. Approximately 30,000m³ constitutes the useful volume, while the remaining 12,000m³ will be press hot water. The stored hot water ensures the supply of district heating for more than 70,000 consumers for up to eight hours. The combined heat and power (CHP) generation system will have a thermal and electric efficiency of 45% each, and an overall primary energy conversion efficiency exceeding 90%. The Jenbacher J920 FleXtra gas engines in the KIEL power plant will have an electrical generation capacity of 9.5MW each. The engines will be housed in four blocks, and can be independently controlled. Designed for multiple starts during the day, the engine is a high-quality standardised generator-set module comprising a generator, engine and a turbocharger. The power unit of the engine ensures low-maintenance downtime as the parts of the unit can be exchanged with a single assembly. Construction of the Kiel power plant is being undertaken in two phases. The first phase includes engineering and erection works for the pump hall, which will connect the electrode boiler and thermal storage to the district heating network. Works of the engine hall walls started in May 2017. The East and West halls, which will accommodate the gas engines, will be 100m-long, 30m-wide and 20m-tall. "The KIEL power plant will replace the existing coal-fired power plant, operating since 1970, and will reduce carbon dioxide emissions by 70%." An operating permit for the entire system, including the gas engines, will also be obtained during the first phase. The second phase includes installation of the gas engines in the engine halls. The gas supply is ensured from the public network, while the existing gas caverns near the plant will serve as a buffer. Electrical energy generated by the coastal power plant will be fed to the Kiel 110kV power supply, with the excess energy redirected to the upstream mains. 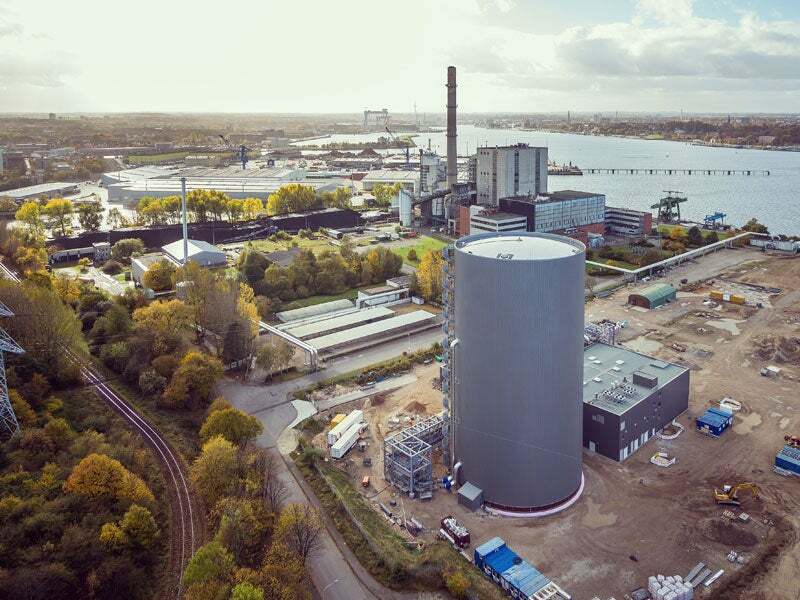 District heating generated by the plant will either be fed into the public district heating network of Kiel or stored temporarily in the 60m-high heat storage unit for future use. Funding for the power plant is provided under the Combined Heat and Power Generation Act (KWKG), which supports highly efficient CHP plants. European Investment Bank (EIB) provided a €105m ($120m) loan for the construction of the Kiel power plant. The loan is part of the European Fund for Strategic Investment (EFSI), the core of the investment programme for Europe. A consortium of banks provided financing for the power plant, including Berliner Sparkasse, Landesbank Berlin, Commerzbank, ING Bank, ING-DiBa, Landesbank Hessen-Thüringen Girozentrale, SEB, and Schleswig-Holstein. Kraftanlagen München (KAM) was awarded the general construction contract for the power plant. GE Energy is supplying the Jenbacher gas engines for the plant. Kraftanlagen offers custom, sustainable energy solutions and is contributing to the type of increased energy efficiency that is key to the success of energy transformation. Kraftanlagen builds piping systems and plants suitable for a range of media, temperature and pressure. Kraftanlagen engineers, calculates and designs power plants that meet the needs of both operators and investors. KÖSTER & Co (KÖCO) specialises in the manufacturing of stud welding fasteners, related welding machinery, metal decks and cold-formed parts.